I'm back with another What's in my bag post! I said in my previous what's in my bag post that I would update you guys with these posts by season because I frequently change the contents in my bag. I know I missed the fall edition but I will try to remember next fall! 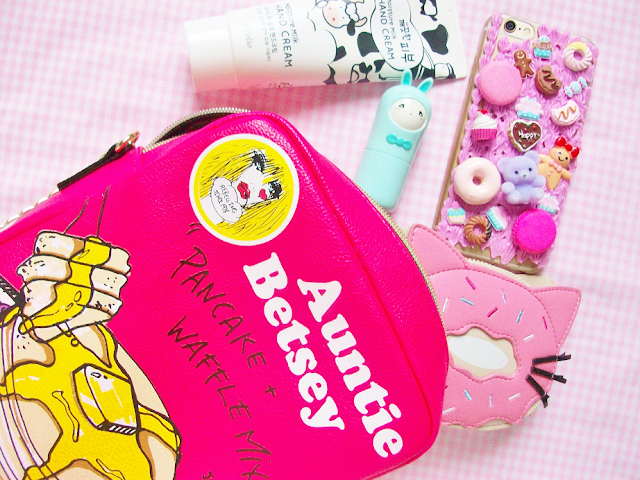 I change out my bag depending on what I'm wearing daily but my most worn bag at the moment is my new Betsey Johnson pancake purse. Today I'm showing you what I currently have tucked away in my bag as of winter 2015. 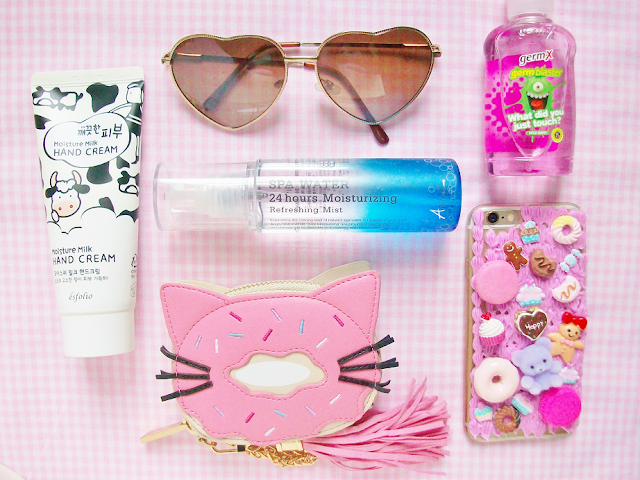 Starting from the left, I have a tube of Esfolio hand cream dressed in some adorable cow packaging, some heart sunnies from Forever 21, Ariul Spa Water 24 hours Moisturizing Refreshing Mist, a cute doughnut kitty pouch from Skinnydip London, some hand sanitizer and my phone that is wearing my DIY phone case. I change out my makeup products depending on what I'm wearing that day. This is what I had on the day I took these pictures. 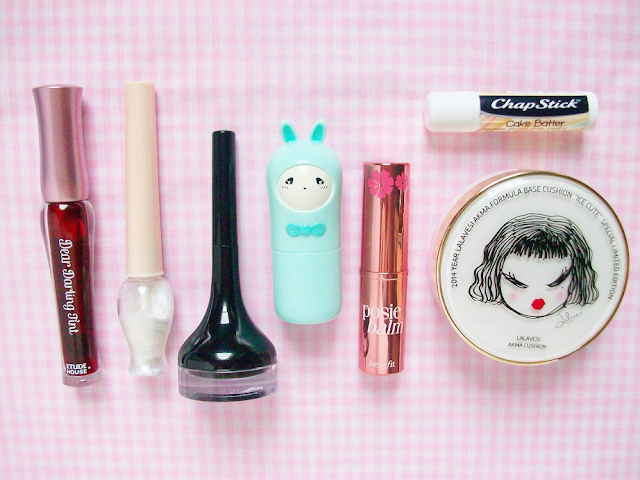 At the far left I have my Etude House Dear Darling Tint, I've been using this tint for a few weeks now and I really love it! Next to the tint I have the Etude House Tear Drop Liner and the Tony Moly Backstage Gel Eyeliner in black. My newest product in my bag is the Tony Moly Perfume Stick in the scent Pom Pom Green Tea, it's smells fresh and clean! 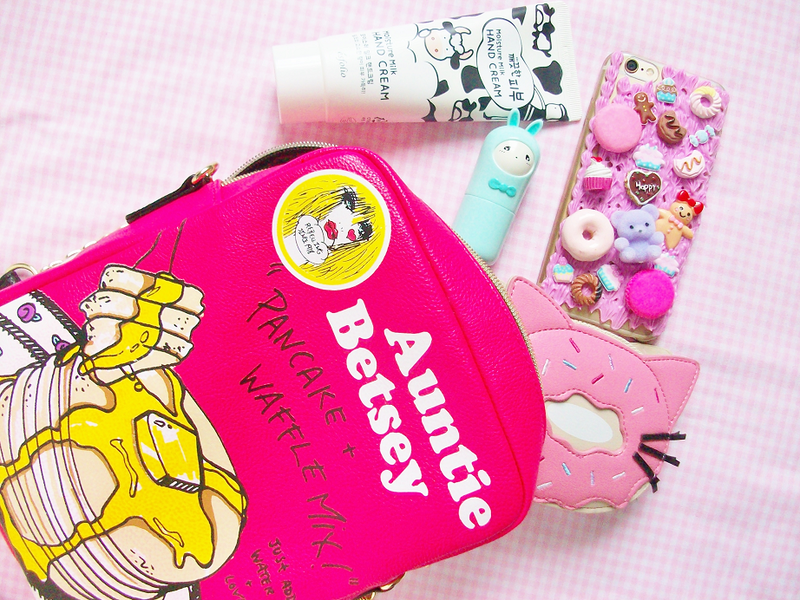 Lastly, I have my cake batter Chapstick, Benefit Posie Balm and my trusty Lalavesi Akma Cushion. 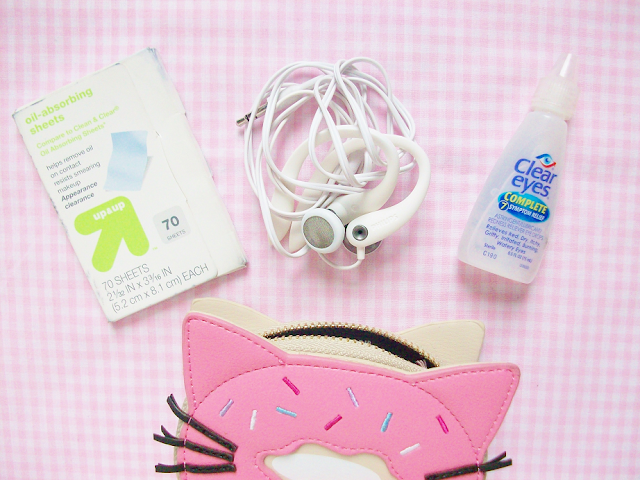 Inside my doughnut kitty pouch I have some oil-absorbing sheets, earbuds and some eye drops. My eyes get really watery in winter so I keep these in my bag just in case. Do you change your bag and bag items by season?